Newspaper gossip columnist Hedda Hopper arrives at the Ricardo's Connecticut home to interview Lucy and Ricky on how their romance began. A flashback transports us back twenty years to the deck of a cruise ship headed for Havana, Cuba. Two young New York stenographers, Lucille McGillicuddy and Susie MacNamara are anxious to enjoy their vacation in the popular Latin resort city - and hope to meet a man. The ship is sorely lacking, however, in male companions. Susie says "I have searched this boat stern to stern, top to bottom, fore to aft, and I haven't found one available man. I hate to tell you, Lucy. We're traveling on a floating YWCA." Lucy says "Brother, they weren't kidding when they said this ship was on its maiden voyage!" The girls do encounter a pair of honeymooners, Fred Mertz (with hair) and Ethel, "his charming child bride of 1934,: and singing idol Rudy Vallee, who is hoping for a little peace and quiet. When the boat docks, Lucy and Susie meet a couple of natives who run a combination taxi-sightseeing service, Ricky Ricardo and Carlos Garcia. At a Cuban nightclub, El Tambor, Lucy and Ricky get romanic and pledge their affection for each other in a specialty drum number, "That Means I Love You." 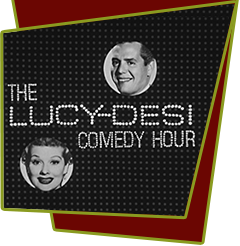 Lucy soon discovers that Ricky's real wish is for a musical career in America, and she pesters Vallee into giving the boys jobs with his orchestra. He agrees, but a misunderstanding leads to a public brawl, and Lucy and Susie land in jail. They inadvertantly drink from a barrel of water that has been laced with rum. They get drunk and nearly miss their boat home. Special Notes: Dancer Barrie Chase, once Fred Astaire's TV dance partner, appeared briefly as one of a group of dancers in a production number early in the show. When this episode originally aired it ran 75 minutes. Desi Arnaz asked US Steel to cut 15 minutes off their show so this episode could be shown at this odd length. While this episode in syndication has been cut to 60 minutes the full length version still exists. Bloopers: In the opening scene, the Ricardos await Hedda Hopper's arrival. Ricky's handkerchief is in his left lapel pocket, but if you look closely as Lucy begins to fix his socks, his handkerchief is on his right!